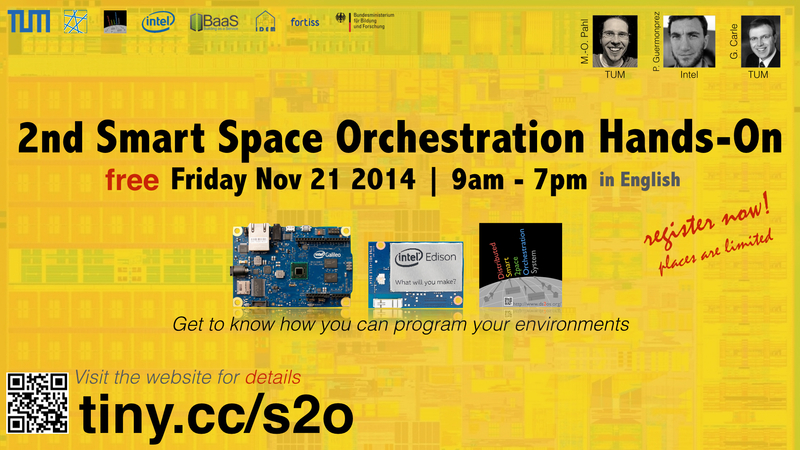 On Nov 21, 2014 about 60 interested makers from academia and industry came together for the 2nd Smart Space Orchestration workshop at the Leibniz Rechenzentrum (LRZ) nearby Technische Universität München (TUM). Marc-Oliver Pahl from TUM and Paul Guemonprez from Intel started the event with a research respectively industry perspective on Pervasive Computing, the Internet of Things, Cyber-Physical Systems, and Ambient Intelligence. In the following experience session, the invited speakers illustrated the broad range of Pervasive Computing from their diverse perspectives. Sebastian Peters (Capgemini, TUM) showed intuitive ways to control smart spaces, Markus Duchon (Fortiss) introduced the smart energy lab at Fortiss, Sunil Ghai (IBM research India) introduced demand and response energy control for smart spaces, Andreas Müller (TWT) talked about predictive automation. Marcel von Maltitz (TUM) presented a system for privacy-aware data collection, Jelena Mitic (Siemens) introduced the goals and methodology of the Building as a Service project (BaaS), Malte Burkert (TU Dortmund) showed the BaaS model house, Benjamin Hof (TUM) envisioned smart meeting rooms, and Juan Haladjian (TUM) demonstrated what can be done with smart cloths today. The day ended with a get-together at Technische Universität München with tasty food, drinks, and inspiring chats. We spent a great day with you! How to make our physical spaces smart? Benjamin Hof - Why do we want Smart Rooms?